I stood in front of a classroom of 25 fourth and fifth graders at Cornelius Hedges Elementary School in Kalispell as they gleefully ate big, warm bites of brownie with brightly colored frosting. You might think this scene would be a FoodCorps service member’s worst nightmare—kids eating decadent, sugary desserts in class!—but I was grinning from ear to ear. Why? Because within several months of teaching after-school cooking classes in the Kalispell Public School District, I’ve discovered a strategy to introduce reluctant children to new fruits and veggies. I’ve learned how to be a little bit sneaky, for a good cause. And I can promise you, these were not your average brownies. 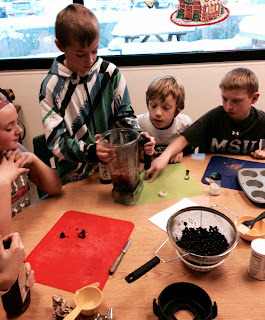 I’m never dishonest or misleading when teaching a cooking class full of elementary school students. Instead, I believe it’s all about letting the kids’ enthusiasm around their favorite, familiar dishes—like these brownies, French fries, or pizza—distract them from the likely unfamiliar leafy, rooted, and brightly colored produce sitting on their cutting boards. Like a game-winning football play or a shrewd military strategy, I’ve had almost universal success with this “distract and conquer” approach. I have discovered that if I “distract” the students with good flavors, familiar recipe names, delicious aromas, or the excitement of trying a new food for the first time, the students won’t mind foreign, or even previously detested, healthy foods making an appearance. It is like the old farmer’s trick of slipping a new chicken into the roost at night so that in the morning when all the other hens wake up, it’s as if the newbie is an old friend. When a child is engaged and excited about participating in the cooking process, he will barely realize he’s been eating lentils and kabocha squash for months, and he is more likely to choose that food when it is served in the lunchroom. Sometimes I even disclose my stealthy skills to the students: I talk to them about “tricking yourself” into eating more fruits and vegetables every day by adding them to smoothies, baked goods or soups in which you can hardly detect their flavor. We have even used this idea to make experimental recipes like chard and red pepper smoothies, roasted pumpkin hummus, spinach nachos, kale chips and Greek yogurt dip. “Who loves brownies? !” I shouted, as I discreetly held a bag of local Montana black lentils. We preheated the oven and got to work on the recipe while I casually mentioned that we would be using pulses instead of flour, as if I’d never baked brownies any other way. None of the students seemed startled. If the recipe calls for locally-grown, protein and mineral rich lentils instead of all-purpose flour, but they still look like brownies, taste like brownies, and smell like brownies, then everybody’s happy. While the brownies baked in the oven, we made creamy frosting from avocados and boiled local beets. The kids had so much fun watching the bright cherry color develop in the Vitamix, that they didn’t seem to miss their regular artificial toppings. And best of all, they weren’t afraid of vegetables in their dessert. After class, a couple of students came up to me, whispering to each other and giggling. They asked if they could have another brownie for their parents. “Of course!” I replied, and as I spooned brownie onto a napkin for them I asked, “Are you sure you two aren’t just going to eat these yourselves?” They just laughed. I found out later that only some of the brownies made it to their moms, but I didn’t mind in the least. Sure, they were being a little sneaky, but then again, so was I.
Preheat oven to 350 degrees F. Spray an 8×8 square baking dish with cooking spray. Combine the beans, eggs, oil, cocoa powder, salt, vanilla extract, and sweetener, in a blender; blend until smooth. Bake in the preheated oven until the top is dry and the edges start to pull away from the sides of the pan, about 25- 30 minutes. Whip avocado, beet, and oil in a blender until combined and no lumps remain. Add sweetener slowly and mix until combined.